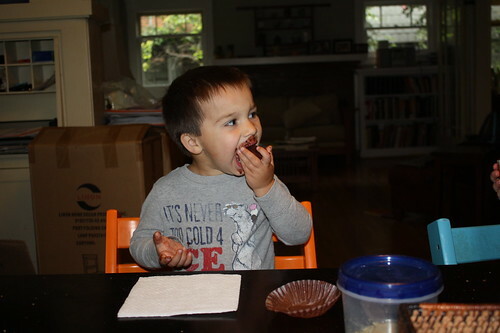 Finn turned three today, so we had a mini-celebration with the Heffs this morning. The plan was to walk over and buy cupcakes at our favorite shop around the corner, but when we got there it was closed. So, we just bought cake mix and frosting at the local CVS and made the cupcakes at home. Finn was very excited to get to help use the electric mixer. 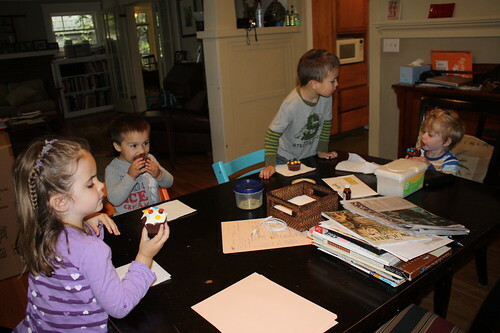 The kids decorated their cupcakes with M&Ms and wolfed them down (well, except our delicate eater, Charlie). I always marvel at just how wide Finn can open his mouth. After the Heffernans left, we had our usual quiet time with a show (his current favorite, Yo Gabba Gabba), with the plan being that when the show was over it would be nap time. I figured he was really hopped up on sugar and could be difficult to get down. 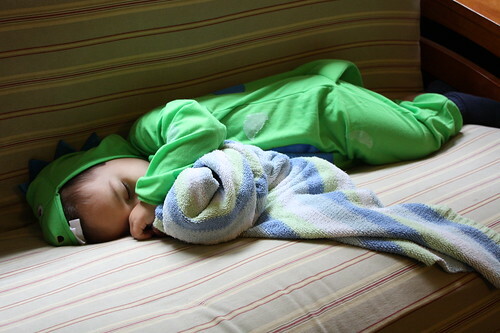 However, when I came back in to check on him about 20 minutes later, he was passed out on the couch. Always cute.